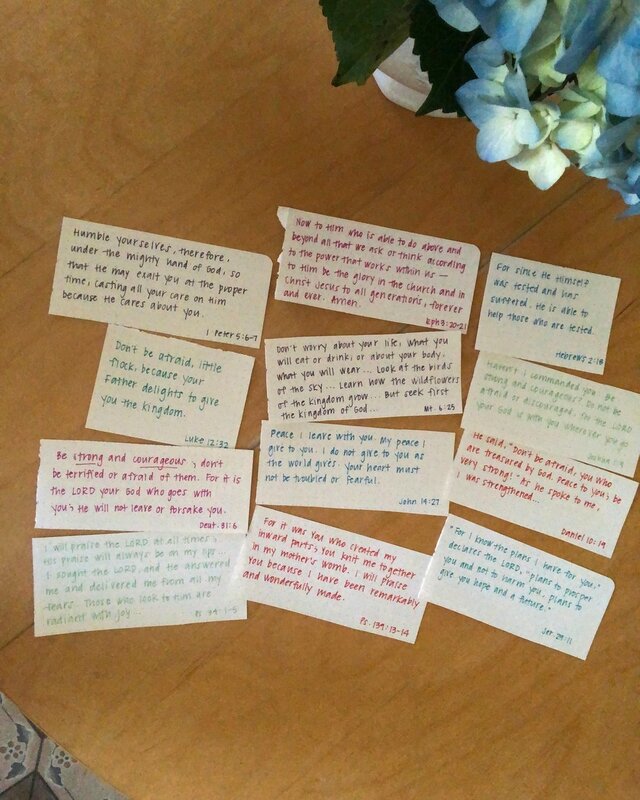 The above photo is a set of scripture cards I made to take with me into the delivery room. I was feeling so much anxiety and fear around the birthing process, and some days during my last trimester, it was all I could think about. I tried distracting myself. I read article after article and blog after blog. I watched countless Instagram stories. I texted friends and family all the time, seeking comfort and encouragement. Those are all good things, and yet I still felt unsettled. Ultimately, I knew I had to combat that fear with the truth of scripture. The week before my due date, I sat down and wrote out these 12 verses. Simply writing them down provided assurance. It reminded me that God’s word is faithful and true (Revelation 19:11). While in the delivery room, I took out the cards at one point and looked them over with Charles. Reading them helped me again set my mind at ease and prepare to birth my son. As I began to push, I felt more confident, strong, and empowered than I had ever before in my life. I know that’s the power of God’s word. These 12 verses are just a sprinkling of those throughout the Bible that speak to our fears. Read them, read the books they come from for the full context, and memorize them. Let them encourage you in whatever you’re currently walking through. Now to him who is able to do above and beyond all that we ask or think according to the power that works in us—to him be glory in the church and in Christ Jesus to all generations, forever and ever. Amen. Haven’t I commanded you: be strong and courageous? Do not be afraid or discouraged, for the Lord your God is with you wherever you go. For I know the plans I have for you—this is the Lord’s declaration—plans for your well-being, not for disaster, to give you a future and a hope. The rare occasion I did both my hair and makeup, hoping baby boy would make his arrival that day! This word has been ringing in my ears. I think it’s from the Holy Spirit. As I wait to deliver our baby boy, I am expectant. I expect God will show up. He will be in every detail. He will orchestrate labor in his precise, perfect plan. I expect my birth plan will only go so far because God’s plan is better. He is purposeful and intentional. He is my rock and my salvation. He is a good, good Father. Provider. Protector. I expect He will cover us in peace and joy. I expect that in my weakness, He will be made strong. I expect my worries and fears will all be for naught because He is in control. An expected end. I love how this translation is phrased. God knows how our stories play out, and He’s been planning them from the beginning. He gives us hope and a future. He desires our well-being and to give us the kingdom. God is my rock and salvation. That’s exactly what I had written in my journal before referencing the concordance. God knew what I needed to read, and He gave me the exact word and passage. He is my foundation; I will never face a situation without Him. He is the great I Am. Charles and I are expectant parents. At 39 weeks 4 days, we are expecting to meet our sweet son any day now. Expecting above all, God’s grace in every moment of our anticipation and beyond. Today I am 37 weeks pregnant. Baby boy is about six pounds, the size of a honeydew melon, and it’s virtually impossible for me to think about anything other than him. I am working full-time, but whenever I have a free second, I am thinking about him. What will he look like? What will he smell like? How will he sleep? Will he be blonde or brunette (or have no hair at all)? What kind of boy will he grow into? What kind of mom and dad will we be? I’m not afraid of being a mom—I’m beyond excited and know God has been preparing me for this for months. But the whole birthing process is still quite scary and overwhelming for me. I wrote early this year about my fear and how I experienced an anxiety attack around Christmas time. I truly think that panic was God's way of waking me up to challenge this fear. A couple days ago, I said to my husband that I've been fearful my whole life. As long as I can remember, even as a child, I've had fear. Fear of giving a presentation at school, fear of the big test, fear of roller coasters, fear of sleepover parties, fear of being left out during a slow song at the school dance. And eventually fear of not being perfect and not measuring up to my own unreasonable standards, which contributed to my struggle with anorexia. The fear has been with me. I know I must have had moments during my childhood where I confidently pursued my dreams and didn't think twice about doing so. A childlike faith, courage, and innocence. I don't believe we are born feeling fearful, but I can't pinpoint a time when fear first crept into my life. It doesn't make sense. My family always loved me and encouraged me. Life was good. So why did fear still overwhelm me? Why was fear this continual thread in my life? The day after I shared this with my husband, I thought, Well, wait a minute. I've also done a bunch of things in my life that I was initially afraid to do. In the eighth grade, I tried out for my school’s play for the first time, and I ended up being cast as Dorothy in our production of The Wizard of Oz. Terrifying yet so fun. I took a trip abroad with my Spanish class the summer before my senior year of college. I cried in the car on the way to the airport because I was already homesick, but 10 days later, I was having so much fun that didn't want to come home. I decided to go to college six hours away from my family, at a school where I knew no one. And then I recognized when I needed help, needed to leave college, and needed to get treatment for my eating disorder. One of the most difficult things I've ever had to do. Post-college, I moved to a Pennsylvania town of 10,000 for a magazine internship. It was there God gave me a newfound interest for his Word and Biblical community, plus a friend who to this day is like family to me. I moved to New York City to pursue a career in journalism and ultimately pursued a relationship with Jesus. In 2015, I was baptized and shared my testimony as an adult with my church. Sensing a new call on my life from God, I relocated to Nashville for the man I love and a job in full-time ministry—even though I had only been to Nashville once before and never worked in ministry. And I started this blog, sharing my story and trusting that’s what God wants me to do. I thought of all these experiences, and I saw God's faithfulness. Anytime I felt afraid and unsure, God was there for me. I also remembered the countless men and women throughout the Bible who God used when they felt inadequate. He turned to people who seemed totally unqualified by cultural standards: Moses, Joseph, Daniel, Mary, the bleeding woman, Matthew, Peter. I read a quote somewhere about these men and women of the Bible that rang so true for me: God doesn't call the qualified; He qualifies the called. Moses repeatedly told the Lord to choose someone else to lead the Israelites to the Promised Land, and God kept reminding Moses that he was made for the journey. Then we have Joseph—a young man sold into slavery by his brothers. He is wrongfully put in prison but eventually becomes ruler of Egypt—and his line of descendants leads to our Messiah, Jesus. Joseph is an unlikely hero. He looked completely unfit to rule Egypt or bring glory to God, but that’s exactly what he did. God qualified him. God didn’t care about how he looked socially or culturally; He cared about Joseph’s heart. Stories of redemption like this are scattered all over the Bible. Mary is greatly troubled. Can you imagine what she felt learning this news? This was not 2019; this was a time when Mary could have been disowned for a child born outside of marriage. Not to mention, she’s only 15 years old. Yet she steps forward in faith. She trusts God, and she doesn’t let fear hold her back. One of my favorite biblical stories is that of Shadrach, Meschach, and Abednego in the book of Daniel. These boys refuse to worship the king of Babylon, and in doing so, are sent to the fiery furnace to burn alive. Daniel 6 describes how the furnace is so hot that the soldiers who brought these boys to it immediately die. Except the boys don’t die when thrown into the fire. They walk around in the fire with God at their side. They risked their lives in order to serve God, and they are delivered from the fire. What stands out the most to me in this story is how God not only rescues them, but He walks with them through the trial. This is truth that I need to cling to. I need to remember this on a daily basis. God walks with us through fear, anxiety, pain, and suffering. He is still good, no matter what we are feeling or experiencing. So does birth scare me? Yes. Will it be worth it? A million times yes. This is God’s plan for me, and He will be there with me through every second of labor and delivery. He’s called me, and He will qualify me. I'll get to meet my son. I'll have the gift of becoming a momma, something I don't ever want to take for granted. I picture holding him on my chest moments after he takes his first breath in this world. His dad and I snuggling him with overwhelming thanksgiving for this good and perfect gift. After publishing my last post, a few of you reached out and told me you also struggle with anxiety or that you have had a panic attack this past year, too. You offered encouragement and truth, and for that, I am so very grateful. We weren't made to fight our battles alone, friends. And we weren't made to sit in anxiety, letting it rule over us. God created us for much more than that. As I've been praying for peace and trust in the Lord's plan in 2019, He has reminded me how important it is to "get up and walk." (John 5:8) I don't see anxiety or panic attacks as sinful, but I do believe we can choose to run after Christ in the midst of those—and that He will sustain us. Below are five practical things that have helped me in the fight against anxiety. Spending time in God's Word—daily—is our absolute best weapon against the enemy. Satan wants to bring you down, and he will use any tactic he can get. In 2018, I noticed I was finally experiencing true healing from my eating disorder. With my desire for control no longer being channeled into what I ate, Satan did everything he could to find a new outlet. Fear and worry cropped up in my pregnancy, in my job, and even in whether my home was clean or not. Sometimes I let those fears hold me back from time with God. In 2019, I'm committed to reading the Bible daily. I have seen firsthand how much of a difference that makes. God speaks to us all the time, and He's given us His Word as a direct form of communication. We just have to be willing to listen. It sounds easier than it is at times. Talk to God. Share your heart with Him in all its messy, anxious, fearfulness. You don't have to clean yourself up before God. In fact, He wants you to come as you are. God's yoke is easy and His burden is light. Go to Him. I often want to Google a solution, phone a friend, or search a book for the comfort I'm looking for. But those times I talk to Jesus first, those are the times I really feel comforted. I can search for answers in a million different places. (And I do.) True peace, however, comes from God alone. I was in a women's group in 2017 where we memorized two verses of the Bible each week. By the end of the year, we could each recite Ephesians 1 and 2 from memory. That practice changed my life. I was amazed at how much those verses from God's Word would come to mind when I needed Him most. Since then, I haven't practiced much scripture memory, but it's a spiritual discipline I want to get back to. I know it's a fierce weapon in the fight against anxiety. So pick some verses—or just one—to memorize and be your mantra in those worry-filled moments. Speak truth aloud over yourself and let it soak into every fiber of your being. 4. Talk to a trusted friend. Open up to a friend or family member you trust. I've learned that the more you are vulnerable with other people, the more they will be vulnerable with you. You can pray for each other, pray together, and encourage each other in whatever it is you're going through. This person can also serve as an accountability partner. Be honest with them, even if you're feeling guilt or shame. Sometimes this means talking to a counselor or therapist. I’ve spent about eight years in counseling, and I truly believe every one of us could benefit from it. I’m actually looking into counseling again now in Nashville because of how helpful my experience was back in New York. As Christians, we need a constant cycle of confession and repentance to experience full freedom. Talk to God and talk to your friend. Go for a stroll, and if you can, leave your phone at home. Enjoy time in God's creation without other distractions. Head to a local trail, go on a hike, or simply walk around your neighborhood. A change of scenery and a bit of movement can be the best thing to help you get out of your own mind. Change your perspective from an inward focus to a greater focus on the Lord. The less I think of myself, the less I worry. And the more I surrender humbly to God and give things up to Him, the better I feel. No matter what my emotions are, God remains the same. We can depend on Him to provide for us, care for us, and sustain us—even in the darkest hour. I’ve been choosing a word of the year since 2016. A new word for each year, and each year, God shows up. While I think about the word and pray about it some before officially choosing it, I’m still not really sure in January what it means for me or if it will affect my year ahead. But then God always does beyond what I imagine He will, revealing more of Himself through that word over the next 12 months. I didn’t spend a lot of time focusing on my word for 2019, because it came to me quickly, and I knew this word was the right one. Peace in my pregnancy, labor and delivery, and parenting. Peace in our families and friendships. This peace is the opposite of fear, worry, and anxiety. It’s the opposite of turmoil and war. Peace takes work. It takes trust in the Lord and faith in His plan. The word “peace” occurs more than 400 times in the Bible. Yes, 400. Try finding “fear” or “anxiety” that many times. Hint: You won’t. And when you do see “fear,” it’s likely referring to the fear of God, a holy reverence and awe of Him, not a feeling of danger. A few weeks ago my pastor gave a sermon where he referenced Ephesians 2, and it has really stuck with me. He said Jesus Himself is our peace—and that God actually created peace. Meditating on that helps bring me peace. Our God is not a God of worry and anxiety but of peace. God sent his son, Jesus, to defeat sin and Satan. He destroyed the dividing wall of hostility between us and God, and He offers new, eternal life to everyone—simply asking we confess that we need Him and that we believe in Him. The cross that Jesus died for us on reconciles us to God and puts to death the hostility. It can no longer overtake us or rule us. It’s done for good. He rose again and is now seated at the throne in heaven. He came and preached peace to all the ends of the earth. Peace is His mission. Peace is His message, and this is the peace that I want to guide my life. The last few months of my 2018 haven’t been peaceful. They’ve been full of worry, anxiety, doubt, and fear. They’ve looked much different than what I had expected for newlywed life. My husband and I work opposite schedules. We have a few hours to be together on the weekend, but that’s it. There’s no time for joining a group together through our church or for making new friends. No time for the seemingly little things like having breakfast with each other or even washing the dishes together. We both value quality time as our top love language, so having such different schedules has been trying to say the least. I haven’t always run to God for comfort and peace. My anxiety has shifted off of my body and food—praise God!—as He has brought significant healing into that area of my life. But when I’m not spending as much time in the Word, in prayer, or in community, the anxiety can crop back up in new ways. In these past few months, I’ve wrestled with anxiety in my pregnancy. I’ve worried about my baby and his health, and I’ve developed a rather intense fear of delivery. I’ve faced anxiety around my job, around Charles’ job, around our home and being “ready” for baby, around our finances, and even around my passion of writing and this blog. This anxiety culminated last month in a panic attack, a first for me and something I felt woefully unprepared for. It was terrifying, and I didn’t understand what was happening in the moment. After I calmed down, I fell asleep for over an hour. It was as though my body shut down, refusing to carry the weight of anxiety anymore. As I’ve been processing through each of these things, I’ve written less and less on this blog. I’ve needed time to work through my thoughts and emotions with God, my husband, and those closest to me. January feels like a new chapter for me and my little family. I keep thinking about the peace of Christ, and I pray this peace will rule in my heart as I have been “called to live in peace. And always be thankful.” (Colossians 3:15) Gratitude truly does change my perspective. When I focus on my blessings, like thinking about this baby boy as a literal miracle, my fear quickly dissipates. When I remember all The Lord has done for me, how He’s given me a new identity and a firm foundation in Him alone, then the stressors of this world become meaningless. Then all I want is to live for Him and to be more like Him. As I read this passage this week, I noticed the note I had written in the margin: Often we go through storms to experience more of God and more of His glory. He uses the storms to strengthen our faith and trust in Him. But He’s always present in the storm and all-powerful over it. Okay, Holy Spirit, let’s do this. 2019, I’m ready.